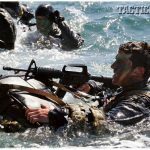 Dive-ready carbines by Heckler & Koch, Colt, FN and more are bred for the amphibious missions of the world’s top spec-ops forces! 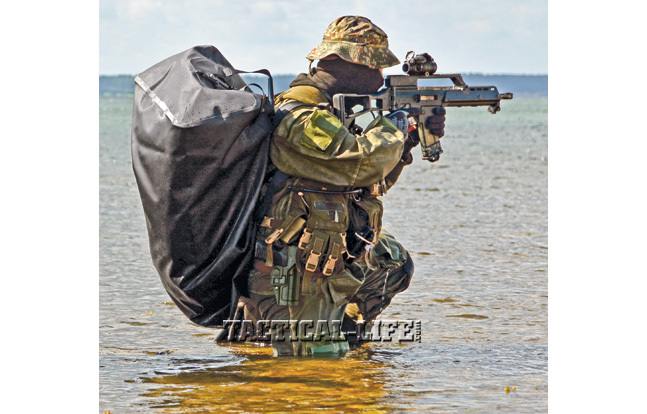 The German Navy’s Kampfschwimmer, or combat swimmers, favor the Heckler & Koch G36K in 5.56mm NATO, which is the carbine variant of the standard G36. 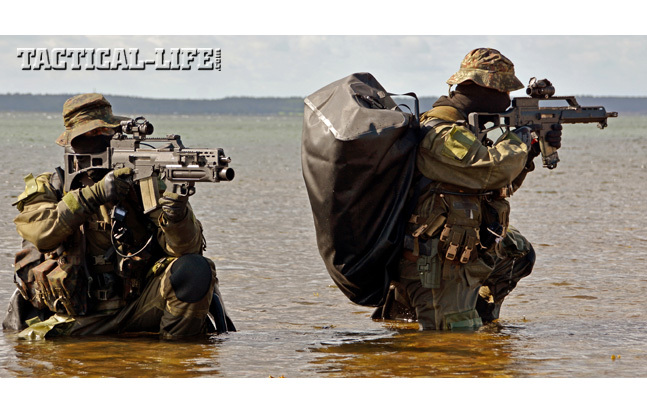 Germany’s Kampfschwimmer are an elite special warfare element similar to the U.S. Navy SEALs. 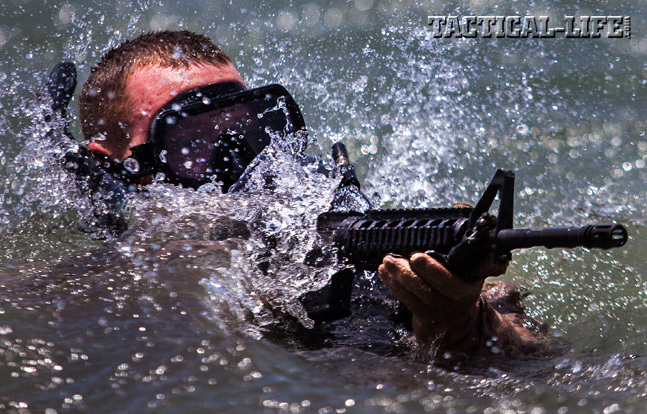 A Marine assigned to the 26th Marine Expeditionary Unit Maritime Raid Force emerges from the surf armed with a Colt M4 Carbine. Two Navy SEALs come ashore armed and ready for action. 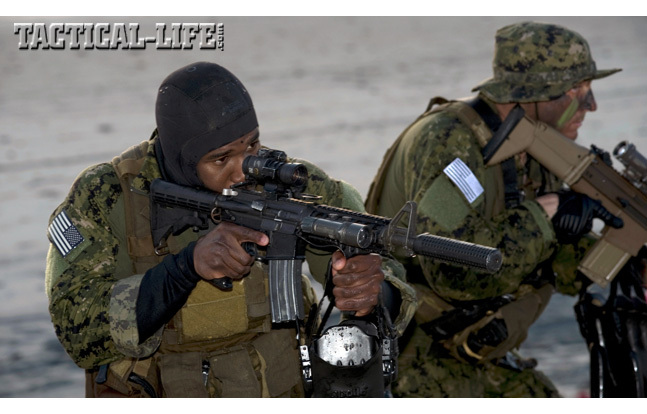 SEALs carry a number of rifles, including the M4A1 (front) and the FN SCAR MK 17 (rear). 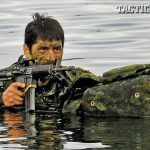 A Canadian soldier conducts a combat surface swim with his Colt Canada C8 carbine during a Patrol Pathfinder course held in Halifax, Nova Scotia. A German Navy Kampfschwimmer scans for targets with his HK G36K carbine, a modular weapon made largely of a carbon-fiber-reinforced polymer. While taking a rifle diving may seem to be a strange concept to many, it is a practice regularly employed by the world’s elite military forces. 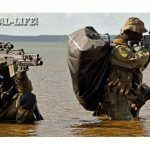 The elite forces that go diving with rifles are known by many names: SEAL teams, Special Forces, Special Boat Service, Recon Marines, Naval Diving Unit, Patrol Pathfinders, Special Tactics Squadrons, combat swimmers and many others. They sometimes use special scuba gear that allows them to swim below the surface undetected, or they may only wear swim fins and a flotation vest as they swim along the surface to their objective. No matter how they swim, they must be armed and ready to engage enemy forces at all times. 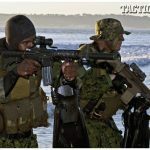 A variety of military rifles are used to go diving, and surprisingly little preparation is required other than standard weapon maintenance requirements. 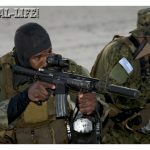 Commonly used rifles include the M16 family of weapons, the HK G36 and HK416, the FN SCAR, the British L85, the Galil, the SAR-21 and many variants of the AK. While most service rifles offer a good degree of corrosion protection, some units procure weapons with special protective coatings. Some units also procure magazines modified for maritime use that include drain holes. Standard practice once the rifle clears the water is to partially retract the bolt and allow any water accumulated in the barrel to drain away. Some units use muzzle covers, but others have found them to be more of a hindrance than a help. At short ranges, rifles can even be fired underwater if an enemy diver is encountered; however, this is not desirable and is best avoided. As soon as it is feasible, based on operational considerations, rifles that go diving are inspected, cleaned and properly lubricated. Now let’s take a look at some of the elite forces and the rifles they go diving with. 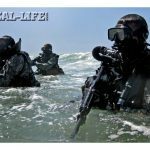 Every service component of U.S. Special Operations Command (USSOCOM), including Army Special Forces, Naval Special Warfare, Air Force Special Tactics and Marine Corps Special Operations Command, routinely go diving with rifles. Navy SEALs are probably most closely associated with diving, as they became the Navy’s combat frogmen upon being established. 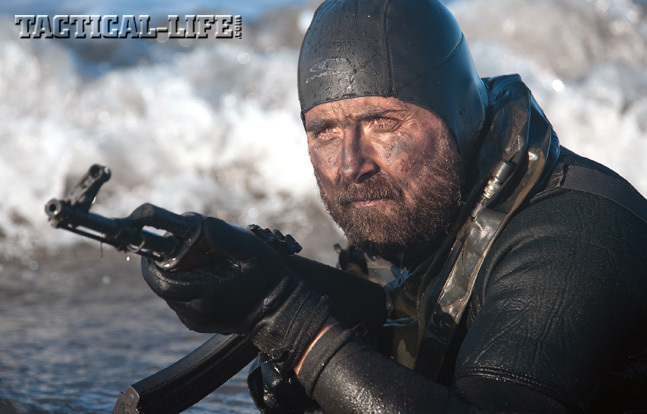 Navy SEALs are unique warriors who conduct special operations in any environment, but who are uniquely trained and equipped to operate from, around and in maritime areas. Their small highly trained teams usually work quietly at night, conducting some of the nation’s most important missions. SEALs are constantly deployed throughout the world to protect national interests. 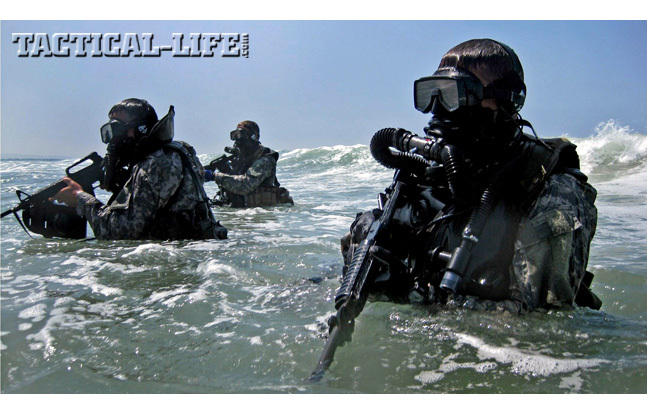 SEAL missions include direct action, special reconnaissance and counterterrorism. Combat swimming and diving can be used to accomplish all of these missions. SEAL training and preparation stresses an enduring commitment to individual initiative, personal responsibility and mission accomplishment. 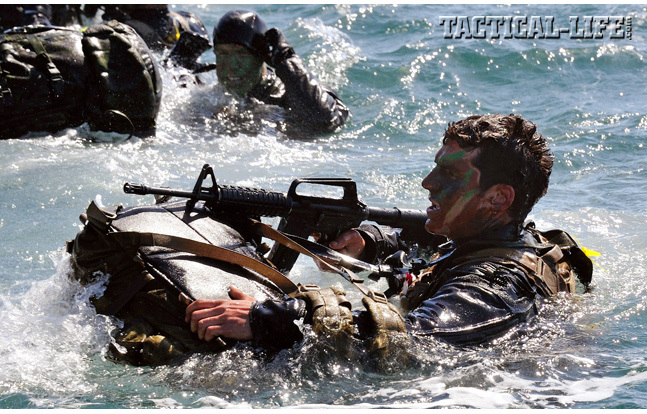 Naval Special Warfare Command goes to great lengths to ensure that SEAL teams have the very best equipment. 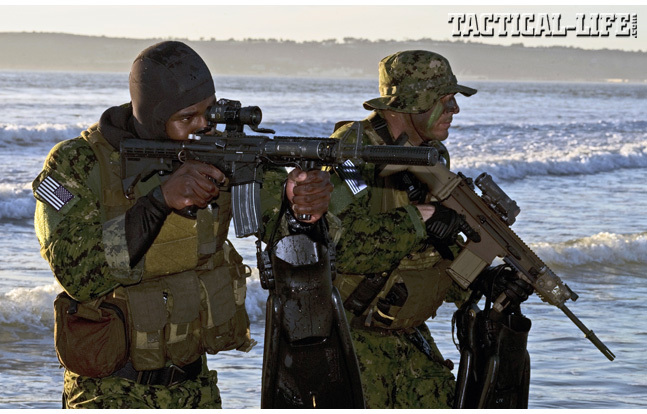 SEALs routinely carry a number of different rifles when they go diving, including the M4A1 Carbine, the HK416 and the FN SCAR MK 17. The Colt M4A1 is a 5.56mm carbine known for reliability, performance and accuracy in the field and is in widespread use by USSOCOM forces. 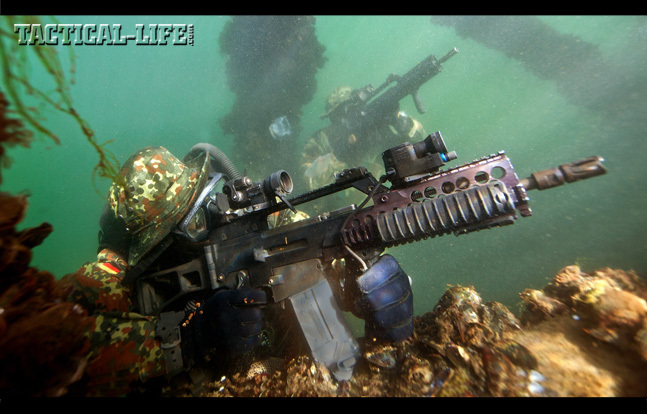 Designed specifically for lightweight mobility, speed of target acquisition and potent firepower, the M4A1 is used frequently by SEAL divers. Heckler & Koch developed the HK416 for U.S. special operations forces as a product improvement of the M4-type carbine. 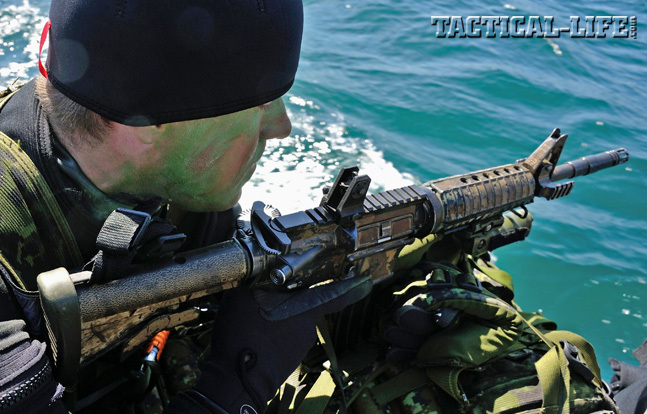 Using the HK-proprietary gas piston system originally used on the G36, the HK416 is designed for harsh environments, including the corrosive maritime conditions the SEAL teams operate in. High-quality steel is used to manufacture a barrel that provides superior accuracy for greater than 20,000 rounds with minimal degradation of accuracy and muzzle velocity. 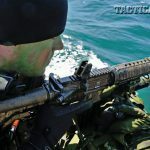 SEAL team HK416 variants also have “OTB” (over the beach) capability and can be safely fired after being submerged in water and not completely drained. HK has also produced a corrosion-resistant steel magazine and a proprietary buffer to improve functional reliability. FN responded to a request issued by NSWC Crane to produce a modular family of weapons known collectively as the Special Operations Forces Combat Assault Rifle, or SCAR. The SCAR-H (Heavy) variant in 7.62mm is known in service as the Mk 17, and it has become a favorite of SEALs who like its hard-hitting firepower. 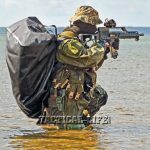 German Navy Kampfschwimmer, or combat swimmers, are the oldest special operations unit of the modern German Armed Forces. The company-size force of Kampfschwimmer falls under the Specialized Forces Marine (SEK M) organization of the Navy and forms the maritime portion of Germany’s special operations forces. They provide unique operational skills in the maritime environment. The ability of the Kampfschwimmer to approach targets underwater, without being detected and in almost any kind of weather, is one of their unique skills. They are able to approach and quickly assault both land and sea targets. At sea, Kampfschwimmer regulary train to board and assault ships, boats and platforms such as oil rigs. On land, they can come ashore on beaches or attack targets such as port facilities. They can also use their unique diving skills in rivers and lakes. Kampfschwimmer favor the Heckler & Koch G36K (K for “Kurz,” or short), which is the carbine variant of the standard G36 rifle. Developed by HK in the mid-1990s, the G36K is a modular weapon system made almost entirely of a strong, carbon-fiber-reinforced polymer, and it uses a simple operating rod gas system. The G36K is ideal for Kampfschwimmer due to its light weight and short length. The barrel of the G36K is chrome-plated steel manufactured using HK’s proprietary cold-hammer forging process for long service life and accuracy. 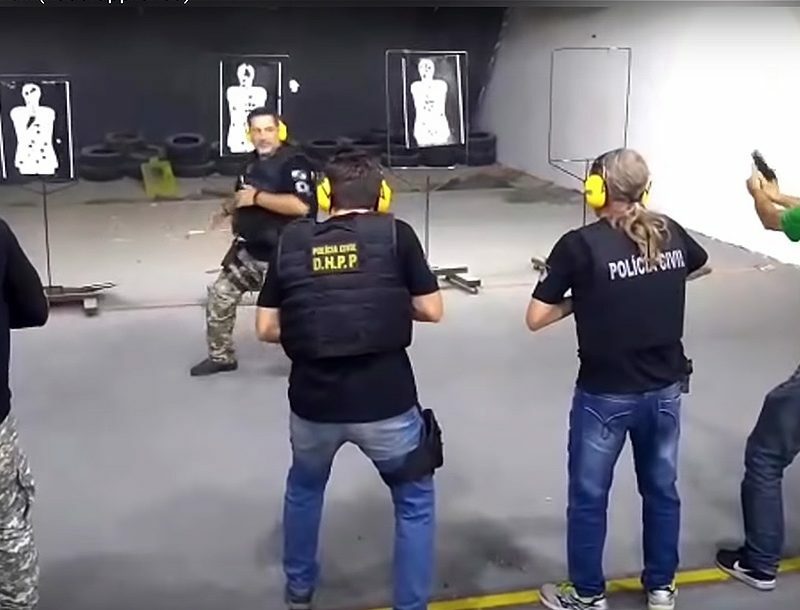 Other weapon components, such as the receiver, trigger group, buttstock, handguard and carry handle, are made of corrosion-proof polymer with stainless steel inserts. This is an advantage in the sea salt environment in which Kampfschwimmer regularly operate. 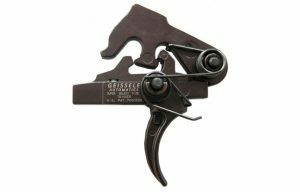 Magazines are also made of translucent high-strength polymer and lock together with a proprietary integrated magazine clamp. 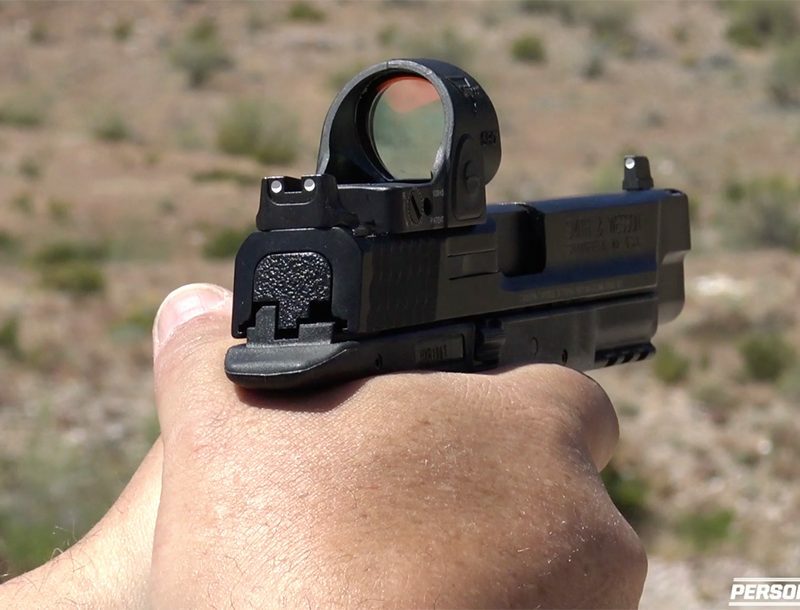 A variety of sighting systems can be installed directly on the top of the G36K receiver, with Aimpoint red dots being a common Kampfschwimmer choice. Germany’s Kampfschwimmer have been deployed on many operations around the world, including counterpiracy operations in the waters off Somalia. They are also ready to respond to domestic terrorist threats. A typical scenario involving counterterrorism would involve a Kampfschwimmer Intervention Team taking down a group of terrorists holding hostages in an urban setting, such as a hotel located next to a canal or river. While the terrorists watch the expected approach routes of a hostage rescue team, the Kampfschwimmer Intervention Team swims to the target unnoticed in the adjacent canal. After the successful underwater infiltration, the Kampfschwimmer make a forced entry, neutralize the terrorist threat with their HK G36K carbines and evacuate the hostages. Inside the Canadian Army there is a small and select group of soldiers called Patrol Pathfinders. They are spread among the Army’s various maneuver formations and play a special role. Their mission is to infiltrate a target area in advance of a main force and conduct the required reconnaissance and preparation that will allow the main combat force to arrive on the battlefield safely and efficiently. They must be able to establish parachute drop zones, austere airstrips, helicopter landing zones and beachheads. To learn this craft, soldiers must successfully complete the eight-week-long Patrol Pathfinder Course conducted by the Canadian Forces Land Advanced Warfare Center. A key element of the course covers amphibious operations, such as establishing beachheads, swimming from surface warships and submarines. 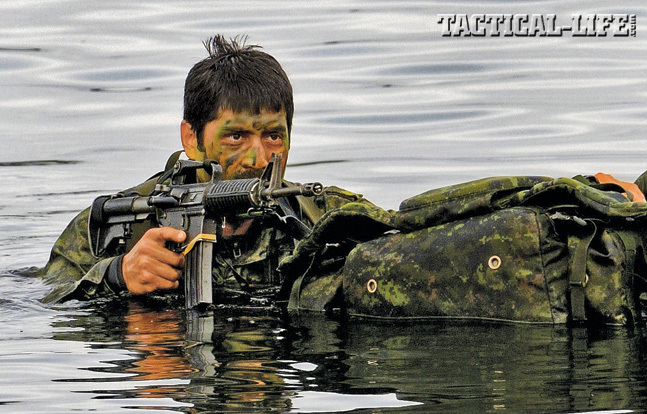 For Patrol Pathfinders, the primary weapon of choice is the Colt Canada C8A2 carbine. The C8A2 carbine is popular with Patrol Pathfinders due to its short barrel and adjustable stock. The direct impingement system of the carbine and the 5.56mm caliber have been battle proven in harsh combat environments, including the arctic snow and ice conditions found in Canada. The C8A2 shares many features of its American counterpart, the Colt M4 Carbine, however, many years of development in partnership with the Canadian Armed Forces have made this weapon system distinctly Canadian. One key feature is a cold-hammer-forged heavy barrel, which gives the C8A2 a much longer service life than many other AR-type rifles. The C8A2 can be custom configured with different optics and accessories, such as lights, to meet the operational requirements of the Patrol Pathfinders. A typical amphibious operation conducted by Patrol Pathfinders might go like this. In a small, war-torn nation, innocent civilians are starving. Canada, as part of a multinational effort, has decided to come to their aid. During the hours of darkness, a Victoria-class submarine partially surfaces just offshore. A small group of Army Patrol Pathfinders and Navy Clearance Divers exit the submarine and swim ashore to a beach that will soon be the landing point of the main force. While the Navy Clearance Divers locate and neutralize any obstacles or mines, the Patrol Pathfinders survey the beach and set up night-vision beacons. Then a message is sent by blinker light to a ship offshore. Soon two platoons of Canadian troops arrive by small boat and move inland to establish a secure perimeter. Shortly after dawn, the Patrol Pathfinders guide the first of several landing craft carrying multinational forces and badly needed humanitarian aid. 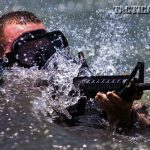 Combat swimmers, such as the U.S. Navy SEALs, German Kampfschwimmer and Canadian Army Patrol Pathfinders are just a few examples of elite military units that go diving with rifles. They serve as a testament to the effective technique of infiltration of waterborne combat forces. 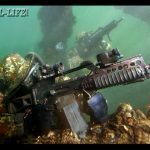 The many weapons they use also prove that rifles that go diving provide reliable and effective firepower even after being submerged in the maritime environment.